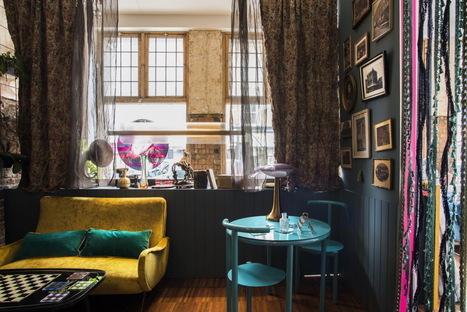 Mad Atelier - established by the Italian architect Chantal Martinelli with her French husband Julien Desormeaux - has brought a wave of Mediterranean style to London's East End. The studio moved into the premises on Lower Clapton Road in the borough of Hackney at the end of 2017. Hackney, which had a bit of a disreputable past has recently been described by the Movement for Liveable London as London’s most liveable borough, not least because its planned public policies to limit traffic and the use of design to improve people's lives. Mad Atelier’s studio and boutique is a former East London pub that had been empty for 10 years before the couple took it over. We're talking about the Lord Cecil, a large pub and former popular waterhole and hangout, featuring punk and reggae gigs. This old pub was a repository of stories, and to this day remains very much alive in the memories of the locals but now it has been given a new lease of life. The spaces have been converted into a boutique, which specialises in pieces by contemporary designers as well as vintage finds picked up by Chantal and Julien from galleries in Milan, Paris and Barcelona. It also inspired the idea for Mad Atelier's first participation in the London Design Festival, where the designers decided to open their own spaces with a site-specific installation, Reconstructing Lord Cecil. As Chantal explains, “We chose our premises largely because we wanted to show how striking Mediterranean design can be in the British context, and nothing is better than a pub to demonstrate that. We have had such a warm welcome here and heard such great stories about the pub, we really wanted to pay tribute to Mad Atelier’s home.” So, from 14 to 30 September, a bit longer than the London Design Festival that officially closes on 23 September, Mad Atelier is sharing its interiors with the general public, transforming them into a pop-up pub in tribute to the legacy of the Lord Cecil. Of course, a pub with no beer is no pub at all, so Mad Atelier have teamed up with small-batch south London brewery Canopy Beer Co to provide visitors with drinks throughout the festival. As well as dishing out the drink, Canopy is also debuting new branding at the show, featuring colourful, animal-inspired artwork from four specially commissioned illustrators on its cans. The designs are inspired by the old-school parlour (and pub) game of Picture Consequences – where players take turns drawing sections of a figure on folded paper, with eccentric and often surreal results. Befitting Mad Atelier’s role as a champion of emerging graphic art and illustration, the new cans and the illustrators’ original artworks will be integrated into the display for the London Design Festival creating a place where the fusion of local history and the owners' history and their choices set the scene for an eclectic visual narrative.